Vortex Bladeless is an early startup that designs, manufactures and commercialises multi-patented bladeless wind turbines. It is based on a new concept of harnessing wind energy that is competitive in conventional wind farms but is also suitable for distributed energy mixing with solar panels. In the future it may also be become suitable for offshore deployment. The project claims it is able to reduce manufacturing costs by 53 percent compared to conventional multi-blade wind power generators, as it removes the most expensive components associated with the blades, nacelle and tower. This means that Vortex also has much lower maintenance costs, as there are no moving parts that require periodic lubrication or replacement. Additionally, there are no components that could, even theoretically, pose a risk to bird life or emit noise disturbance, and for this reason several environmental groups, including the SEO Birdlife Association are actively supporting the project. The project has received funding from oil and gas company Repsol and has also managed to raise funds of over 1 million Euros from private and public funds in Europe. REM talked to David Suriol about this new technology to find out more. What is Repsol’s interest in this, given that they are an oil and gas company? Like any oil company, Repsol knows that they have to improve and invest in new clean energies – it’s good for business, and for their Social Responsibility. Repsol has an initiative, called ‘Fondo de Emprendedores’, that they run in Spain but for local and international entrepreneurs working on a spectrum of projects related to efficiency, renewables and generation. This programme incubated us in its first edition, from 2012 to 2014 – the package included a donation of 288 thousand euros, office space and no equity! Basically, Repsol gave us the opportunity to validate our project. The claim that Vortex presents no risk to birds or emits noise somehow implies that conventional wind turbines do, yet this has been consistently discounted by numerous studies. Surely then that particularly marketing claim acts against the wind energy sector in general rather than promoting it? The truth is that environmentalists are still fighting about it, and studies show results to support both sides. As far as we are concerned, the risk to birds is an economic liability for the wind industry. The wind turbines to not run when there is bird migration – that is a reality. An investor has to hire environmentalists to take care of the birds in the wind turbine field area – that is also a reality. Wind turbine projects are also being sued for environmental reasons. We do not want to use marketing claim acts against wind turbines. We like the way we are getting energy from conventional wind turbines, in fact we need to learn from this technology. But we are presenting a new technology, disruptive, dramatically cheaper and environmentally friendlier. We hope conventional wind turbines and Vortex will share the space to collect energy from the wind. How does this turbine work? Vortex Bladeless uses a radically new approach to capture wind energy. Our device captures the energy of vorticity, an aerodynamic effect that has plagued structural engineers and architects for ages (vortex shedding effect). As the wind bypasses a fixed structure, its flow changes and generates a cyclical pattern of vortices. Once these forces are strong enough, the fixed structure starts oscillating, may enter into resonance with the lateral forces of the wind, and even collapse. Instead of avoiding this aerodynamic instability, our technology maximises the resulting oscillation and captures that energy. Naturally, the design of such a device is completely different to a traditional turbine. Instead of the usual tower, nacelle and blades, our device has a fixed mast, a power generator and a hollow, lightweight and semi-rigid fiber glass cylinder on top. Our wind generator does not have any moving parts in contact, which eliminates the need for lubrication and reduces wear and tear. Also, it’s known that a structure can only have a certain frequency of oscillation, which limits the number of working hours. However, thanks to a self-tuning magnetic coupling system, Vortex can operate in a wider range of wind speeds. Our technology has two main advantages over the traditional wind turbine: we are cheaper, and more environmentally friendly (noise absence and no oil required for maintenance). To demonstrate the feasibility of the technology, we have tested dozens of prototypes in wind tunnel, and we are currently doing field tests of complete small-scale equipment. To what extent has this device been tested and certified? Over the last four years, we developed a technology, from an idea to a proof of concept in the wind tunnel, and from the wind tunnel tests to multiple wind field tests. Currently we have a Vortex with all the technical milestones developed: oscillation, synchronisation to a different range of wind velocities and power generation. From now we are optimising the whole device to have the first product. How close is the project to commercialisation? In less than one year we will have our first pre-commercial prototype. At the same time we are looking for places for manufacturing and have already established in Massachusetts to run the commercialisation from the US. How much power is a device like this able to generate and how does that compare with conventional wind turbines? The first Vortex will be 4 kW and 12.5 metres in height, for small-scale/residential wind. Because our swept area is lower, we need to be higher than traditional wind turbines. Fun fact: a 4 metre high mast made by standard composite materials weighs 3.8 kilograms. When we compare the two technologies (Vortex vs conventional wind turbine), Vortex can collect 30 percent less energy from the same swept area, but it is so cheap that the costs of energy are reduced by over 40 percent. Plus, we achieve a reduction of operational expense (OPEX) and capital expense (CAPEX) of over 50 percent. There are minor issues related to logistics and manufacturing. The manual process to build a blade is far away from how we are going to make our ‘bladeless’ structure, but the concept is easy to automatize. Surely these generators will still have a visual impact on the landscape if deployed in large numbers, are you therefore expecting or already encountering any opposition from anti-wind interests? Just the opposite, everybody recognises the more ‘natural’ structure in Vortex than the multi-blade wind turbines. Fortunately, we can install more power in less space. Not just in the open countryside, but also on building roofs or, in the future, for offshore structures. Our wind wake is more narrow than the conventional wind turbine. We tested in a wind tunnel to put one Vortex just in front of another and the second one actually benefits from the vortices given off by the first structure. Different institutions are in love with this power wind generator (MIT, Harvard, Bird Life etc). Where to you envisage this technology being in, say, twenty years’ time? Our vision is to start introducing the technology for self-distribution in the next 18 months. Vortex with solar panels, working together, making a more stable curve of production and reducing the payback over two years. We see Vortex starting in those places where the grid is not as good as we have in EU countries. We still have a lot to prove and much work to do. The first Vortex Gran (+1 MW) in 2018, and from there the offshore sector. 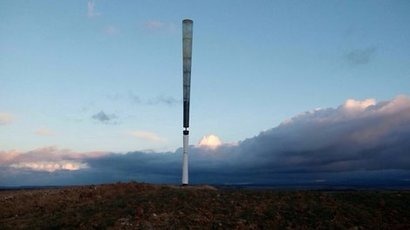 I hope in 20 years Vortex will be the next wind generator model we will see deployed in the landscape. You are really amazing. Very attractive post, greeting to everyone. You should visit our website to find out more about An Overview Of Depleted Uranium.